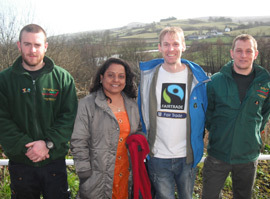 Ammanford Fairtrade Group member Phil Broadhurst joined members of Garstang Fairtrade Group as they pioneered The Fairtrade Way, a new long distance path going from Garstang (The first Fairtrade Town in the world) up through The Lake District to the Fairtrade Town of Keswick. Unfortunately I didn’t have the time (or, possibly, the legs) to join the Garstang walkers on the full 80 mile trek, but I did join up with them on Day 4, for the stretch between the Fairtrade Towns of Kendal and Bowness. Joining a group of walkers who were in the middle of an 80 mile 6 day trek was a bit daunting. I couldn’t help thinking that, if these were real “serious walkers”, then this might not be such a fun day! It turned out that I was OK. By Day 4 their aches and pains were slowing them down nicely, and, even better, (I am feeling guilty as I write this!) one of the walkers had pulled out injured and so was now able to drive, carrying bags, and even brewing up refreshing Fairtrade cups of tea in a lay-by at one point. All of this made me think I was a bit of a cheat and a wimp only doing this one section… But, on the other hand, I couldn’t help thinking I’d timed my entrance well, and feeling glad that this was clearly going to be a fun day out rather than just a politically correct challenge to my pain threshold! We met up at Kendal’s Quaker Meeting House. Quaker Meeting Houses are normally good places to meet nice people, and this was no exception. After posing for The Westmorland Gazette, we were guided out of town by two Kendal Fairtrade supporters and up on to the Heights for our first (cloud obscured) views of The Lakeland Fells. Others had joined the walk for the day, as they did on each stretch, which was good, because I could feel less of a fraud, and because it’s always good to spread the Unity! I tend to feel a warm glow of comradeship just when I’m behind someone in the Co-Op who’s buying Fairtrade bananas, so this coming together of Fairtrade supporters in the hills of The Lake District was an epic piece of inspiration for me! We were chatting and walking and getting to know each other. There were fellow OXFAM shop workers… and lots of vets! It seems Garstang is full of Fairtrade supporting vets! One of the 3 on this walk (or was it 4?) was Bruce Crowther, the man credited with first coming up with the idea of the Fairtrade Towns campaign. He told me he wasn’t a serious walker and was pushing himself on this walk, to push Fairtrade, and to prove again that “Anyone can do anything”; an important message in these times of political apathy and cynicism. As we all walked along discussing our various town’s campaigns, swapping ideas, making plans, I was wishing that all Fairtrade Group meetings could be held on the move, walking through scenery like this… It definitely gave an extra energy and enthusiasm to every idea. Our halfway lunchtime stop was at Stavely, a small village with a big Fairtrade presence. We walked off the main street into a strange mix of industrial pre-fab units and adapted old stone buildings. This was no normal industrial estate! – There were art galleries and tourist shops alongside Fairtrade cafes, a Fairtrade wine shop and a Fairtrade Coffee Wholesalers. I’d brought my marmite sandwiches even though I knew we were stopping at a café for lunch, as even Fairtrade cafes don’t always have a decent vegetarian option. WILF’S, though, ticked all the boxes, and, fuelled by a memorable veggie burger, I continued on my way with increasingly flattened sandwiches remaining firmly in my pocket! Most of the route from Stavely to Bowness followed The Dales Way. Each time we passed the Dales Way signposts, we were thinking “It’ll be good to see signs going up marking The Fairtrade Way one day”. As we came into Bowness we stopped for a photo at the end (or the beginning) of The Dales Way. A plaque there says “Ilkley, 81 miles”. In a few years I’ll be able to use these photos to persuade people that, not only did I walk the full 80 miles of The Fairtrade Way, but I also walked the full 81 miles of The Dales Way… and all in one day! We carried on down through the beautiful autumn fields and into the busy tourist town of Bowness. It felt good to be in Bowness with mud on my boots for once, as I normally only go there as a “Peter Rabbit” tourist! Our walk finished at St Martin’s Church, with the grave of a freed slave, Rasseals Bellfield. 200 years ago abolitionists campaigned on the principle that “It is simply immoral that people should be allowed to suffer in order to provide us with luxuries such as tea, coffee and sugar”. That’s a message that still rings true for all of us walking The Fairtrade Way today… whether it’s The Fairtrade Way from Garstang to Keswick or The Fairtrade Way from your kitchen to your local shop.